Caroline, an American tourist, took the Ring Road to get to the Pyramids and thought the red brick buildings on both sides of the road were under construction. Her guide did not tell her they were passing through slum areas, informal developments illegally constructed on agricultural land, buildings that are raised without any specifications. The scene is common in Cairo, and in many other governorates. In an attempt to reduce the visual pollution, President Abdel-Fattah Al-Sisi has ordered that all red-brick buildings with unpainted exteriors be painted in a unified colour scheme. Egypt’s ubiquitous red brick buildings convey an “uncivilised” image of the country, Prime Minister Mustafa Madbouli said during a meeting with the Council of Governors held late last week. Madbouli added the process of painting would be monitored, and that legal action could be taken against those who do not abide by the decision. No details were given as to what kind of action might be taken, leaving many citizens with worryingly unanswered questions. “To paint an unpainted building made from bricks you must first render it with cement, a huge cost for the inhabitants. We want officials to tell us who will pay the bills, the building owners or the tenants,” said Abdel-Salam Abdallah, a resident of one of Giza’s many informal areas. While there has been speculation that buildings as yet untenanted will not be connected to utilities unless they comply with the painting rule, what worries Abdallah is the fate of buildings that are already occupied. Others sounded happier about the presidential order. 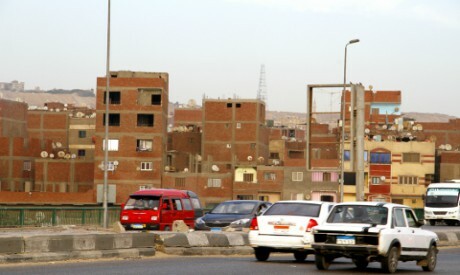 “Red brick neighbourhoods are really ugly and depressing,” says Mohamed Ahmed, an accountant living in Cairo. Consultant engineer Abbas Mahmoud believes randomly built redbrick buildings should be painted by an architectural expert with an eye for art. The expert should use colours that harmonise, he says, adding that costs could be kept down by using lime-wash. He points out that in traditional neighbourhoods people often decorated the exterior of their homes with Hajj paintings. “There really is a sense of beauty in traditional neighbourhoods and the spontaneous art that exists there is witness to this,” says Mahmoud. The situation could have been avoided altogether had municipalities been doing their job, he adds. Municipal authorities should ensure no illegal construction takes place. Those who violate building codes, and the officials who allow it to happen, should both be punished, believes Mahmoud. Mohamed Abu Seada, head of the National Organisation for Urban Harmony, has been quoted as saying that the starting point for the painting will be buildings alongside the Ring Road leading to the new Grand Egyptian Museum, scheduled to be inaugurated next year. According to Abu Seada, different governorates will use different colours. It has been proposed that façades in Cairo and Upper Egypt be painted earth colours, while those in coastal governorates be painted blue.